Transcranial alternating current stimulation (tACS) of the brain during sleep has now been shown to increase human ability to accurately assess hidden targets in novel visual scenes. © 2018 HRL Laboratories. HRL Laboratories, LLC, in collaboration with University of New Mexico (UNM), have published the first study showing that transcranial alternating current stimulation (tACS) of the brain during sleep increases human subjects’ ability to accurately assess hidden targets in novel visual scenes. The new “closed-loop” method effectively reduces the typical overnight drop in performance for novel scenes by about 48%. The theory on slow-wave oscillations relating to memory retention is that new sensory information is initially encoded in the hippocampus of the brain for short-term storage. Then, because they can be quickly forgotten, the memories are transferred during sleep from the hippocampus to the cerebral cortex where they are integrated and consolidated with previous knowledge. This enables the new knowledge to be remembered and generalized better, increasing retention of new skills for longer periods. As the first study in which closed-loop electrical stimulation was used for hippocampus-dependent memories, the HRL research takes tACS to the next level. 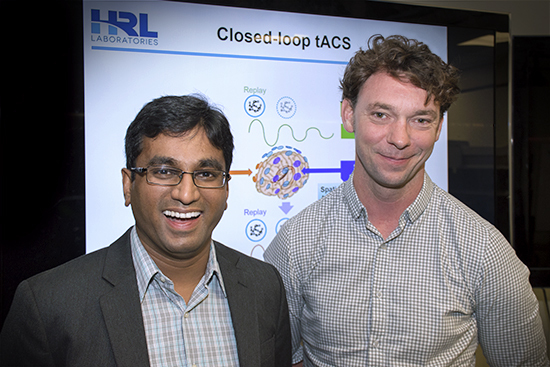 HRL researchers Praveen Pilly (L) and Nicholas Ketz (R). © 2018 HRL Laboratories. In the experiment, subjects had tACS applied or not applied (sham group) during sleep overnight. Their performance on the task was then measured over time to detect persistence of enhanced learning. The study had a within-subjects counterbalanced design in which subjects came in a few days after their initial stimulation and testing, and changed between active and sham conditions. The design greatly reduced noise in performance estimates, but it is relatively rare to have a study with one adaptation night and two experimental nights of sleep because of the amount of time subjects must volunteer. Aaron Jones, Dr. Natalie Bryant, and Dr. Vincent Clark of UNM were the other authors on the paper. They helped design the behavioral paradigm, analyze the behavioral data, and also collected all the data. Entitled Closed-loop slow-wave tACS improves sleep dependent long-term memory generalization by modulating endogenous oscillations, the paper was published in the July issue of Journal of Neuroscience. This research was supported by the Biological Technologies Office (BTO) of the Defense Advanced Research Project Agency (DARPA) under the RAM Replay program. Dr. Justin Sanchez, current BTO Director, was the program manager.